We left for a trip to Mexico in the month of November. We decided to stay in Playacar and I would recommend everybody else who is planning a trip to Mexico to book their accomodation in either Playacar or Playa del Carmen because of the ideal location. Both these towns are close to all the holiday action and you could easily rent a bike or go on a walk outside your holiday resort. One of the seven world..
Playacar is located about 10 minutes by foot from Playa del Carmen but it also has a local bus station which is really handy if your intentions are to explore some more areas around Playacar. As for shopping there is a big shopping centre and a lot of shops, restaurants and bars in walking distance of the resorts. Playa del Carmen has a more buzzling centre with again lots of eateries and bars to enjoy at night. You could say there is one main street where all the villa's and resorts are located and all the touristic attractions evolve around this area. I'm less enthusiatic about Cancun because late at night you would be more isolated and definitely in need of a privat vehicle to get to the different parts of town where all the people are. The Maya ruins of Coba,..
We stayed at a resort called Wyndhammaya in Playacar which was really nice. From here we planned several excursions and did some great tours. 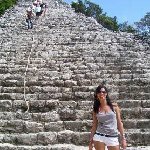 My favourite would be the excurions to the pyramid of Coba and the whole area around it. We also visited the ruins of Tulum which is located beautifully on the beach and really worth a visit. If possibile visit Tulum without a guide and a group of tourists because the time you'll be given to look around is limited so the best thing to do is to rent a vehicle a stay for as long as you wish. Visiting the Xcaret park in..
Another trip I would recommend is the catamaran tour to the island of Isa Mujeres which is just stunning! Also very pretty is the natural park of Xcaret. Did you enjoy Tours and Excursions from Playacar and have you been on a holiday in Playa del Carmen, Mexico? Where to stay in Playa del Carmen: We stayed at a resort called Wyndhammaya in Playacar which was really nice. What to do in Playa del Carmen: Another trip I would recommend is the catamaran tour to the island of Isa Mujeres which is just stunning! 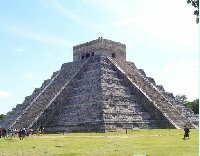 One of the seven world wonders in Mexico. The Maya ruins of Coba, Mexico. On the beach at the site of Tulum in Mexico. Visiting the Xcaret park in Mexico. The beach at the resort in Playcar, Messico. Holding a shark on the Catamaran Tour in Mexico. Ziplining in Mexico, near Coba. 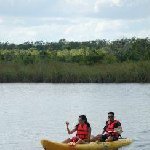 Photos of our day tour to Coba, kayaking. On the beach in Playacar on the Riviera Maya. Photos of our trip to Mexico. Disliked: Some places are better to visit without a tour and by renting a car and driving up there yourself.